Valentine’s Day is just around the corner… that day filled with red hearts, dinner for two and of course, flowers from your sweetheart. One of the most romantic ways to present flowers is with a hand-tied bouquet. The French tradition of gathering and tying flowers produces a bouquet with a look that is more natural and organic and less arranged. Select a few varieties of blooms that go well together, choosing a color palette that is not too busy. Here are a few of my favorite blooms to use in order to achieve that “hand-picked from the garden” look. After choosing your blooms, organize the stems in order of when they will be added. Start with greens and large focal flowers followed by filler and smaller delicate blossoms. There is nothing worse than using stems that are not prepared properly! To clean stems, strip thorns and leaves off the part of the stem that will be in water. Remove any outer guard petals that don’t look fresh. Gather your greenery or “base” in one hand while adding in the layer of focal stems. 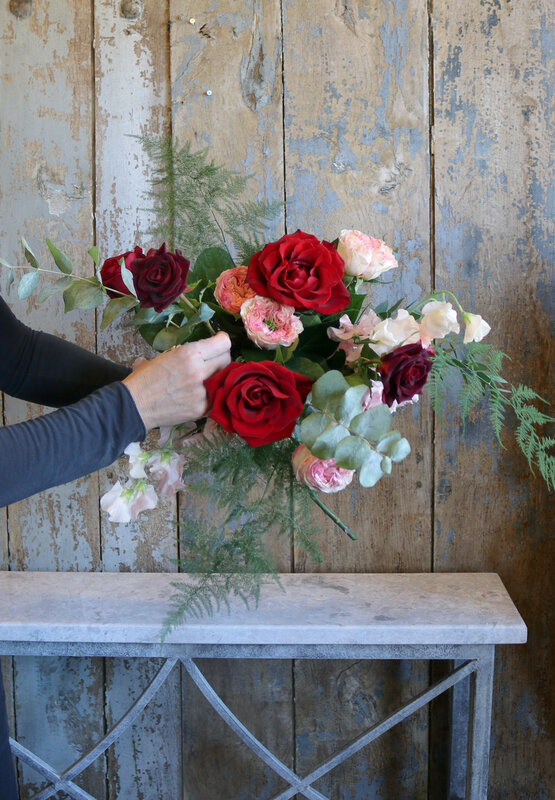 As you add blooms, rotate the bouquet with a spin of the wrist to make sure the bouquet is balanced on each side. Add base flowers and greens all the way around so that it is well-proportioned. Add fillers such as wax flower, for example, to vary the texture; add foliage to give a whimsical feel to your bouquet. I love adding vine as the final touch. Secure your bouquet with floral tape or an elastic band. Snip stems according to your vase height, cutting stems at an angle for better water absorption. Fill your favorite vase with room temperature water. Most flowers do not like their water temperature to be too cold. Don’t forget to add flower food and change the water daily. Check our website for our flower food recipe and more tips on fresh flower care. If you prefer hands-on instruction, join us for one of our popular workshops. Click here to find out first about new and upcoming workshops.